Shovel Ready, the debut novel by Adam Sternbergh, is set in a future dystopian New York City featuring a trash collecting, hitman protagonist. 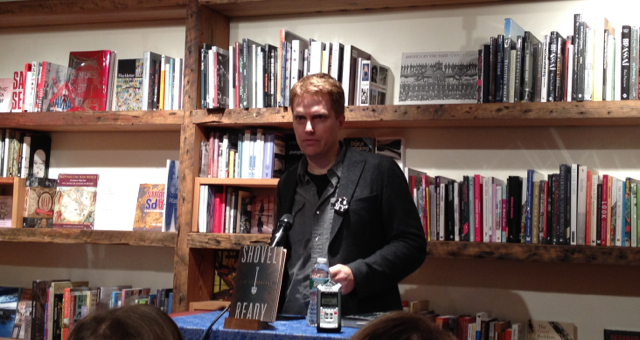 BookCourt celebrated the release of his book by hosting Sternbergh for a reading. Sternbergh is the culture editor for the New York Times magazine and a former editor at New York Magazine. He humbly thanks the many people involved in the production of the book: “Your number fear is it will disappear,” he says of the process of publishing. Eight days earlier, Sternbergh became a father. His recent fatherhood seems to have set the mood and he talks about birthing the book with his editor, calling the novel the product of two people. His editor, he credits for planting the seed, is present too with his own small child. The future is dark for New York City. People have deserted it after a dirty bomb has rendered parts uninhabitable. The wealthy spend most of their time connected to an internet like system simulating life while the poor suffer on the street level. Sternbergh reads the opening chapter, a conversation between Spademan, the protagonist killer, and a customer. The other chapter Sternbergh reads reflects on Spademan’s past, before things have gone wrong in the city, in his life, when he still collected garbage. Trash collectors come across a variety of odd items that people throw away like double ended dildos and taxidermied animals; Spademan finds a still breathing baby. Though there is class consciousness in the dystopia, the thing Sternbergh really wanted to capture was the sense of change that occurs in the city. Most of his time in New York has been during the economic boom times of Bloomberg years that saw rapid changes to the socio-economics of the city. These changes all have made the city unrecognizable to someone who knew the city in the 1970s. He wanted to capture that same sublime feeling someone from now would feel in the future after many drastic changes. While he was writing the book, the Occupy Wall Street movement was playing out across the city as well and some of that sentiment leaked into the narrative. The novel includes two distinct groups of people, those with the means of escape and those without. Sternbergh explains that its the same latent anxieties people feel today about New York’s rapid changes. One moment from the Occupy movement that definitely directly inspired a scene in the book was the notorious police officer in California caught on camera spraying protesting students directly in the face with pepper spray. Sternbergh had been working on a different project before beginning Shovel Ready. That project he now calls a terrible idea. He didn’t know what he wanted to be writing. The aborted novel was an allegory of New York’s media culture set in hell, an over the top version of New York that was bigger and busier and more crowded. But in hell. It wasn’t working. The big take away from that project was that New York couldn’t be replicated in a way that simply exaggerated it. The solution in Shovel Ready was to empty out the city, to remove the people and winnow it down to the remains. While struggling to write this project–a book he recognized he wouldn’t read himself–he was reading things he enjoyed like The Maltese Falcon and Cormac McCarthy. Finally he knew the direction he wanted to take. In the eighth grade, he says, he wrote a detective story. A children’s book author who read it wrote him a note saying that it was a nice story, but he should stick to what he knew. “I’m in eighth grade and I live in Toronto; why would anyone care?” he asked himself. But ultimately, writing a dystopia detective story set in the future is exactly what he knows: its the sort of thing that he reads. The book began as a moral question. Sternbergh didn’t plot out anything. For him, the challenge was in finding the answer to the problem of having a morally reprehensible character, someone on the edge of society, and then bring him back to humanity. He wrote the book in secret at 5:30 in the morning. He wanted to be able to simply delete it if he felt it wasn’t working out. Obviously, it has.